Tomorrow afternoon sees the “network premiere” of New in Town (2009) on Ch4, but I already had a second-hand copy waiting on my stack, so I thought I’d write it up today in a desperate bid to appear cool and cutting-edge. For those who don’t know, this rather half-hearted rom-com stars Renée Zellweger as ‘Lucy Hill’, a supposedly “high-powered” (but comically inept and clumsy) consultant dispatched from her company’s cushy Miami office to oversee the downsizing of a manufacturing plant in the small, snowbound town of New Ulm, Minnesota. At first she is disdainful of their folksy ways, ugly crafts, and ludicrous accents… but eventually she realises (as the writers so proudly point out on the commentary track) that the warmth of their hearts is inversely proportional to the coldness of the climate. Aw, shucks. Yawn. Y’know how in a lot of comedies there’s that scene where the protagonist is unwittingly rude or gossipy with someone who later turns out to be their new boss, or some other important authority figure? Well, they have one of those here too, and it’s incredibly stupid: Lucy is invited to a dinner party by her new secretary/native guide, ‘Blanche Gunderson’ (Siobhan Fallon Hogan), and introduced to ‘Ted Mitchell’ (Harry Connick Jr.), a slobby country music-fan in a plaid shirt who spills beer down himself when he first sees her, then bickers with the snooty newcomer across the dinner table about how best to raise his daughter, ‘Bobby’ (Ferron Guerreiro). The next day Lucy is scheduled to have a crucial meeting with the local union rep to discuss her plans for the plant, and when the scheduled time arrives it’s Ted who’s sat outside her office waiting! The reason I found this so annoying is that Blanche later claims that she specifically arranged the dinner party so that Lucy could meet Ted in a relaxed, informal setting before their big meeting, but aside from making a vague suggestion that he might be someone of note when they were first introduced, Blanche never made the effort to explain who he was at any point after that, or previous to the “shocking reveal”. Apparently Ted didn’t bother mentioning their appointment the previous evening either… and no one else at the party made any reference to his occupation or his professional relationship to her! Ack! I can buy the idea of two strangers randomly meeting in a public place, and one not realising the other’s potential significance… but when two strangers have been specifically invited to a party to be introduced to one another, it’s a much harder sell. I think the story loses a lot of steam towards the end, with all the off-screen corporate shenanigans… I mean, it’s hard to take joy in a “happy ending” when you don’t entirely understand what has happened, or how it will actually improve anyone’s lives. Somehow J.K. Simmons (playing factory foreman ‘Stu Kopenhafer’) made me care about the fate of the workers through the sheer quality of his acting, but I don’t understand why the writers had to make the resolution so convoluted. And every time Blanche mentioned her f*cking tapioca recipe, I was praying that it wouldn’t prove to be a major plot point, so I almost threw my remote at the screen when it was revealed that her pudding was the miracle balm that would embiggen Lucy’s heart and save the town! As for the romance between Lucy and Ted… meh. They went through all the motions, and I can see how some of the scenes could have been quite sweet and moving in some other, better movie… but there just didn’t seem to be any spark between the pair of them here. I was also annoyed by the way the script stacked the deck so heavily in favour of New Ulm over Miami… since all we ever see of Lucy’s metropolitan life is her jogging along an empty boulevard, or sitting in her empty apartment, or getting (metaphorically) shafted in the company’s conference room. She never mentions having any friends or family in Florida… any ties to the place whatsoever, beyond some vague “city gal” brags at Blanche’s dinner table, when she’s talking down to the locals. I’ve never been to Miami, but I assume there must be other people living there, besides Machiavellian businessmen, right? Are handsome widowers, hospitable housewives and gruff-but-lovable father figures really in such short supply in coastal regions? Were they run out of town by pastel-suited drug-dealers, back in the ‘80s? Maybe I’m just biased by the fact I’m freezing my arse off here in Blighty, but give me sunshine and beaches over snow and ice any day of the week! Speaking of which, this movie was filmed on location in Manitoba, Canada, where the temperature would frequently drop below -50 °F (-46 °C), causing the cameras and other equipment to malfunction. 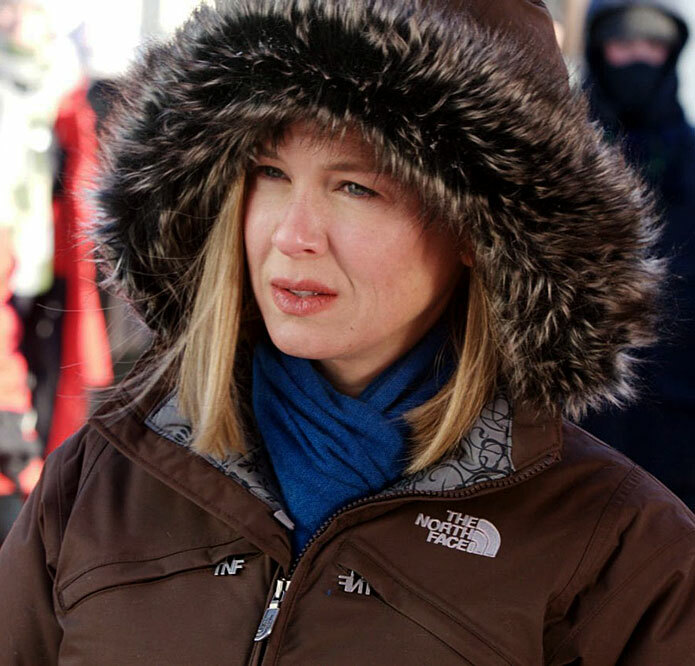 When Lucy first arrives in town, she’s totally unprepared for the climate (because apparently this savvy businesswoman has never heard of Google), so Zellweger was required to stand around in freezing temperatures wearing ridiculously inadequate clothing. Now, I can imagine (maybe) making that sacrifice for a deeply personal passion project… to tell a story that I felt needed to be told, to send an important political message, or to help shape a vision that I thought would push film-making forward as an art form… but for a floppy rom-com that plays like a poor man’s Groundhog Day without any of the jokes or spirituality? WTF was she thinking!? I understand that a lot of actors just like to keep busy… and a lot of them enjoy the challenge of working under harsh conditions, to prove their mettle… but, c’mon, this can’t possibly have been the best screenplay she read that year, can it? A lot of critics suggested she was miscast in the role, and I have to agree that it’s a blatant waste of her innate adorability, even if she does make a very cute Suit. Meanwhile, Simmons put on 40 pounds for the role, joking on the commentary that this was his Raging Bull… um, except for the whole critical acclaim and accolades part, I guess. Gah! Oh, and Frances Conroy is in this stinker too, slumming it as a nosy neighbour of Blanche’s, who (in a deleted scene) breaks into her house at night to steal her coveted recipes! Note: For no apparent reason the people who designed this DVD and its packaging chose to kept the commentary track a secret. It isn’t mentioned on the back of the case with the other extras, and is only accessible through the “Set Up” menu. To be honest though, you don’t really hear anything you couldn’t learn from the “making of” anyway! This entry was posted in Rants about Films and tagged Ferron Guerreiro, Frances Conroy, New in Town, Renée Zellweger, Siobhan Fallon, Siobhan Fallon Hogan. Bookmark the permalink.